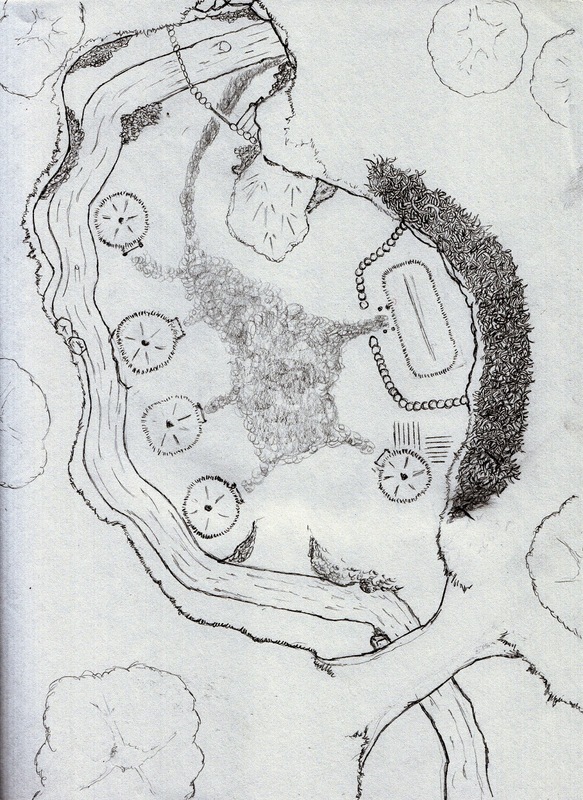 My next step is to make a rough draft of the map on an 8.5x11 sheet of paper. I do this lightly, in pencil, so that I can erase neatly and cleanly. There is frequently a lot of erasing going on in this phase as I try and figure out what "looks good" before committing it to a hex or grid. The first rough draft. This was drawn in pencil and scanned such that the pencil marks look a lot darker. At this point, I really didn't have a clear idea of what this was supposed to be other than a collection of huts inside a sinkhole. Admittedly in the back of my head I was thinking of some of the native settlements in X1: Isle of Dread as well as the lizardfolk tribe in the Kingmaker AP. After some consideration, I went with the latter as inhabitants, thinking this to be a small settlement. As for what is inside the settlement - there is the large longhouse to the right. I envision this as the main house for the head of the family or tribal elder. Directly south of that sructure is a round hut with some gardens. This, presumably is a cleric or sage's hut. there is a central area (either gravel or dirt) and to the south is a boat ramp fo easy access to the stream. The stream flows from the top of the map to the bottom. At the top the stream exits a large cave, crosses under a wooden palisade, follows the cliff line and eventually passses under the arch. In this iteration the arch has sufficient room to walk alongside the river. The cave is unmapped. There is a path leading into the cave but it is quite narrow. Also, above the longhouse are many vines. These could be stranglevines or something similar. Between the house and the cave is a slope leading to the plateau above the village. Lastly, there are numerous places along the stream where the walls of the sinkhole have collapsed into the water. That's all. The next map will be my first attempt to put all this onto a grid.